The purpose of this document is to present an overview of the trends observed between 2001 and 2016 for the French language and the official language minority populationNote 1 in Prince Edward Island. To this end, it provides census-based information on the population who reported having French as their mother tongue, French spoken at home or used at work, French as their first official language spoken as well as for those who speak French well enough to sustain a conversation. In 2016, 17,875 people reported being able to conduct a conversation in French, either exclusively or together with English. As a whole, they represented 12.8% of Prince Edward Island’s total population. The number of persons who report being able to conduct a conversation in French, whether exclusively or in combination with English, has increased by 11.4%, or by 1,835 persons over 15 years. In 2016, 17,745 people in Prince Edward Island reported being able to hold a conversation in both English and French, up 11.3% since 2001. For the 2016 year, the English-French bilingualism rate stood at 12.7%, up 0.7 percentage points since 2001. In 2016, 97.3% of the official language minority population reported being able to hold a conversation in both English and French. By contrast, this proportion stood at 9.8% for the rest of the population. Among the official language minority population, the proportion of persons that report being able to conduct a conversation in both English and French has decreased by 0.9 percentage points which translates to 690 fewer persons since 2001. By contrast, English-French bilingualism for the rest of the population has increased by 1.4 percentage points amounting to an additional 2,500 persons over the same period. This map shows the proportion of the Official Language Minority Population found in each Census Subdivision in Prince Edward Island in 2016. In this map we use seven distinct colours to signify different values. Blue stripes are used to represent areas for which no data are available. There is 1 Census Subdivision in this group. A solid teal colour is used to represent areas in which no one of the Official Language Minority Population resides. There are 18 Census Subdivisions in this group. A solid green colour is used to represent areas in which the Official Language Minority Population constitutes less than 2.5% of the total population. There are 65 Census Subdivisions in this group. A solid yellow colour is used to represent areas in which the Official Language Minority Population constitutes between 2.5% and less than 5.0% of the total population. There are 15 Census Subdivisions in this group. A solid orange colour was used to represent areas in which the Official Language Minority Population constitutes between 5% and less than 10% of the total population. There are 5 Census Subdivisions in this group. A solid red colour was used to represent areas in which the Official Language Minority Population constitutes between 50% and less than 75% of the total population. There are 3 Census Subdivisions in this group. This table displays the results of Data Table. The information is grouped by Census Subdivisions (appearing as row headers), Official Language Minority Population, Total Population and Official Language Minority Population , calculated using percent units of measure (appearing as column headers). In 2016, the official language minority population numbered 4,590 persons in Prince Edward Island. This figure represented 3.3% of the province’s total population. Both in terms of size and proportion, these figures are the lowest levels the province has seen in 15 years. Over the 2001-2016 period, the official language minority population decreased by 12.6% which translates into 660 fewer persons. In 2016, Prince Edward Island’s official language minority population was the fourth largest in relative terms (3.3%) from among all provinces and the territories. They were closely followed by Manitoba and Nova Scotia (both at 3.2%). 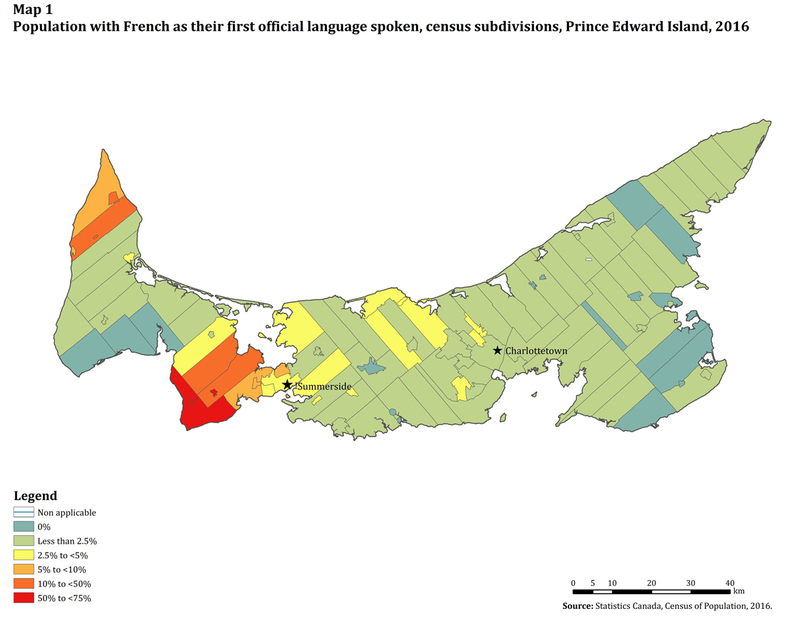 In 2016, 5,400 people in Prince Edward Island reported having French as their mother tongueNote 2, either exclusively or together with another language. At the time, this figure constituted 3.9% of the province’s total population. Since 2001, the number of persons who report having French as their mother tongue, either exclusively or together with another language, has decreased by 11.0%, that is, by 670 fewer persons. In 2016, 5,590 people reported speaking French at home at least regularly (most often or as a secondary language). Collectively, they represented 4.0% of Prince Edward Island’s total population. Since 2001, the number of persons who report speaking French at home at least regularly (most often or as a secondary language) has grown by 7.7%, or 400 persons. Over the 2001 to 2016 period, the number of persons who reported speaking primarilyNote 3 French at home fell from 2,710 in 2001 to 2,200 in 2016, an 18.8% decrease. By contrast, over the same period, the number of persons who reported speaking French regularly as a secondary language in addition to the main language at home grew from 2,265 in 2001 to 2,995 in 2016, a 32.2% increase. Further, the number of persons who reported speaking French equally with another language most often at homeNote 4 grew from 215 in 2001 to 395 in 2016. In 2016, 3,910 workers reported using French at work at least regularly (most often or as a secondary language), amounting to 4.6% of Prince Edward Island’s working population. In the 15 years since 2001, the number of persons who report using French at work at least regularly (most often or as a secondary language) has decreased by 2.6%. Among workers who use French at work, 1,060 persons reported using primarilyNote 5 French, down 4.1% since 2001. In 2016, these workers constituted 1.2% of Prince Edward Island’s working population, a proportion which has remained virtually unchanged since 2001. Between 2001 and 2016, the number of persons who reported using French regularly as a secondary language in addition to the main language at work decreased by 160 workers, down 6.1% since 2001. In contrast to the decline of both primary and secondary use of French at work, the number of persons who reported using French equally with another language most often at workNote 6 increased from 290 in 2001 to 390 in 2016.